What is Omega 3 good for? Omega 3s are an important anti-inflammatory and an essential fatty acid. They support heart, joints, mood and gut health. The problem is your body is unable to make Omega 3's on its own! So you must depend on the food you eat and supplements to ensure your body gets what it needs for health. Here are the many health benefits you can get from daily consumption of Omega-3 fatty acids. Research shows people who take adequate amounts of Omega-3 fatty acids have higher calcium levels to ensure bone strength. People who do not eat enough fatty acids have lesser bone strength and density than people who take the recommended levels. Omega-3s have a protective effect against inflammation. Studies show an Omega-3 rich diet may prevent as well as reduce the risk of breast cancer in women and also reduce metastasis. Consumption of fatty fish may help to reduce prostate cancer-specific mortality in men by over 60%. Fish oil is a rich source of Omega-3 fatty acids, and it helps in reducing depression. People who eat foods that have higher levels of Omega-3s enjoy reduced mood swings. People who are suffering from bipolar disorder may be able to fight depression if they regularly take Omega-3 fatty acids. Omega-3s are also found to reduce depression and manic problems in juvenile bipolar disorder. Omega-3s may also be highly useful for treating women experiencing postpartum depression. The supplementation of fatty acids can also help to reduce attention-deficit/hyperactivity disorder (ADHD) in children. It has also been found that the Omega-3 fatty acids can help to support your memory as well as the nervous system. It has been researched that eating fish rich in Omega-3 fatty acids has positive effects on blood sugar levels in people with diabetes. Regular consumption of Omega-3 rich foods, especially fish helps to lower fasting glucose concentration and also helps to increase insulin levels. Studies also show Omega-3s reduces the risk of mortality associated with coronary heart disease in women suffering from diabetes. 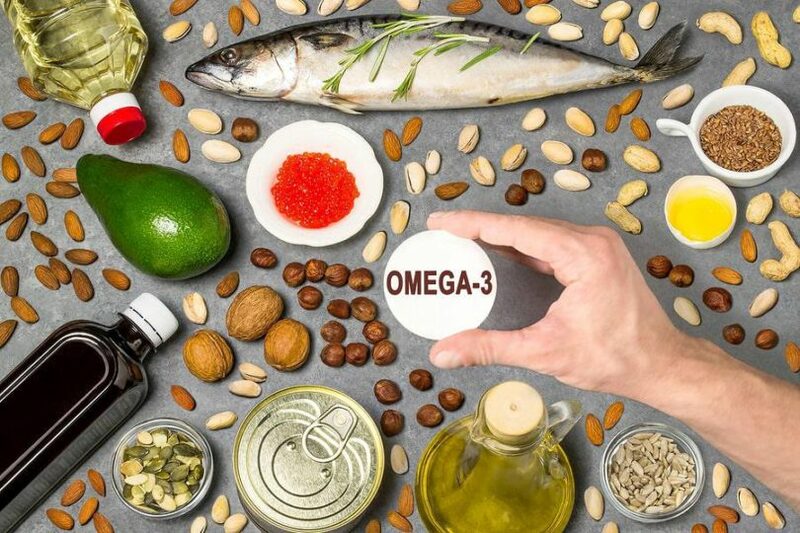 Consuming Omega-3s at least 3 times per week may decrease the risk of developing Alzheimer's and dementia. Also, regular consumption of Omega-3 fatty acids is found to be effective in treating kids with autism. 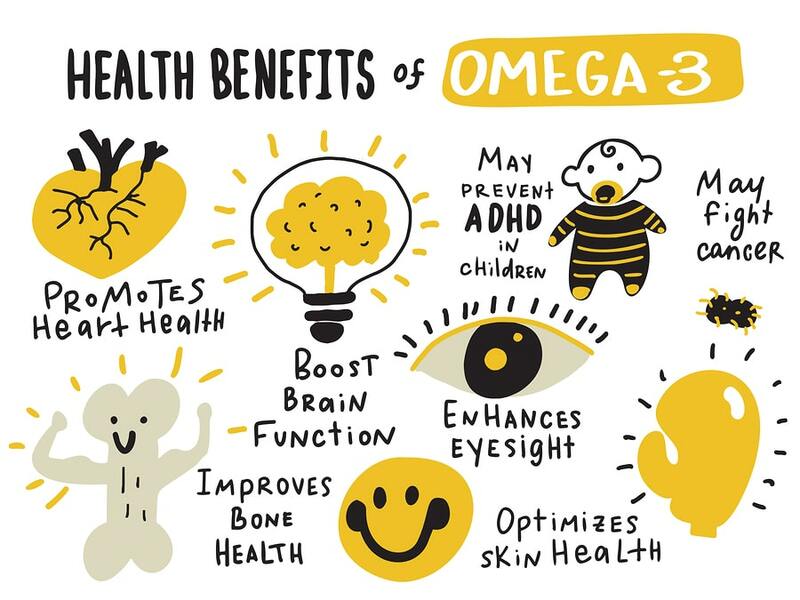 Taking in Omega-3s along with required quantities of zinc and magnesium proved to be beneficial for emotional, attentional and behavioral problems in children and well as teenagers. One of the ways to decrease the risk of developing asthma is to eat a lot of Omega-3 fatty acids. Kids who eat fatty fish are less likely to develop asthma throughout their life. Adults can also enjoy the benefits of Omega-3 rich fatty fish that helps to reduce asthma symptoms and problems. Omega-3 fatty acids are found to reduce the level of triglycerides in our body. Elevated triglycerides are a reason for heart diseases. People suffering from coronary heart disease are advised to take higher quantities of Omega-3s to prevent artery blockage and blood clotting. Fish oil has been found to reduce the problems of irregular heartbeats or arrhythmias. It is also very effective in reducing the risk of stroke and helps in effectively treating the narrowing and hardening of arteries. If you take fish oil supplements after you have had a heart attack, then the risk of getting another heart attack is reduced. It will also help in preventing atrial fibrillation in men and women who have undergone coronary artery bypass surgery. Omega-3 fatty acids help to reduce the risk of arterial disease associated with chain smoking. Omega-3 fatty acids are highly effective in reducing joint stiffness and pain of Rheumatoid Arthritis. 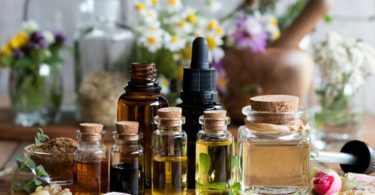 They are also found to enhance the effectiveness of anti-inflammatory drugs. One of the most effective ways to take care of an aging lymphatic system is to feed it with high-quality, lymph-moving Omega-3s. Studies show that Omega-3 fats help to remove toxins from the intestines responsible for food intolerances and digestive imbalances. There is some new research that shows that Omega-3 fatty acids from fish oil support healthy lymph circulation in the brain. This may help explain some of the longevity and cognitive benefits from fish oil supplementation. As you just learned, Omega-3 is a polyunsaturated fatty acid that offers many health benefits. But these fatty acids are not the same as saturated fats found in butter or lard. In chemistry, polyunsaturated fats are in liquid form at room temperature. They remain liquid even when you freeze them. Omega-3 is considered essential because your body cannot make it on its own. This is the reason it's important you eat food that contains it or supplements. Once ingested, the alpha-linolenic acid is converted into eicosapentaenoic acid (EPA) and docosahexaenoic acid (DHA). These fats can be found in fish oil, herring, halibut. Some algae also contain DHA. It is the EPA that plays a vital role in preventing cardiovascular disease. The DHA is important in the proper development of the brain and nerves. The cell membrane must maintain its fluidity and integrity to function properly. If your cells do not have a healthy membrane, then you will lose a significant amount of water and also the ability to store vital nutrients. Your cells ability to communicate with other cells will also be disrupted. If your body loses cell to cell communication, it can lead to cancerous tumors. With a diet rich in Omega-3, your cell membranes will have a high degree of fluidity. How Do Omega-3s Help Brain Healing? Omega-3s are important for the whole family – even kids and seniors. 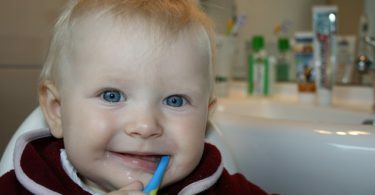 In fact, they are important for children's health, even before they are born. A study showed that babies born to moms who took Omega-3 supplements (DHA and EPA) during pregnancy scored higher on cognitive tests at age four than mothers who didn't supplement. Omega-3 is often turned to as a treatment for childhood depression. One study conducted back in 2006, took depressed kids ages 6-12 and gave them fish oil. They found that the symptoms of depression improved significantly. ADHD may have lower levels of Omega-3s in their bodies than normal. Many studies have looked at fish oil supplements as a treatment for ADHD. They found that these supplements may improve behavior, boost attention and reduce hyperactivity in kids under the age of 12. As we age, the risk of developing a serious condition like heart disease, increases. But the good news is, if you have Omegas in your diet, those risks decrease. Omega-3s have major benefits for the heart. Not only can they help prevent health problems, but they can also be used to cut the risk of complications in those already diagnosed with heart disease. Omega-3s can help keep your heart rhythm steady. Studies have found that fish oil may help reduce symptoms of morning stiffness and pain. Studies have indicated those who consume higher levels of fatty fish may have greater bone density. Various studies have found that Omega-3s may help prevent memory loss, and lower the risk of dementia. Now that you know all the benefits of Omega-3, let's look at how you can get more into your life and body long-term. Flaxseeds, chia seeds, walnuts, fish, cod oil, oysters, and caviar are great choices. They contain large sources of Omega-3 fats. Flaxseed, walnuts and chia seed are at the top of our list for increasing Omega-3s. One-quarter cup of walnuts contains 2.7 grams of Omega-3 fatty acids, while a one-quarter cup of flaxseeds contains around 6.4 grams. By combining the one-quarter cup of walnuts with a tablespoon of flaxseeds or chia seed, you'll get close to the recommended 4 grams of Omega-3 fats. One cup of navy beans, soybeans, or kidney beans will give you between 200 and 1,000 milligrams of Omega-3s. 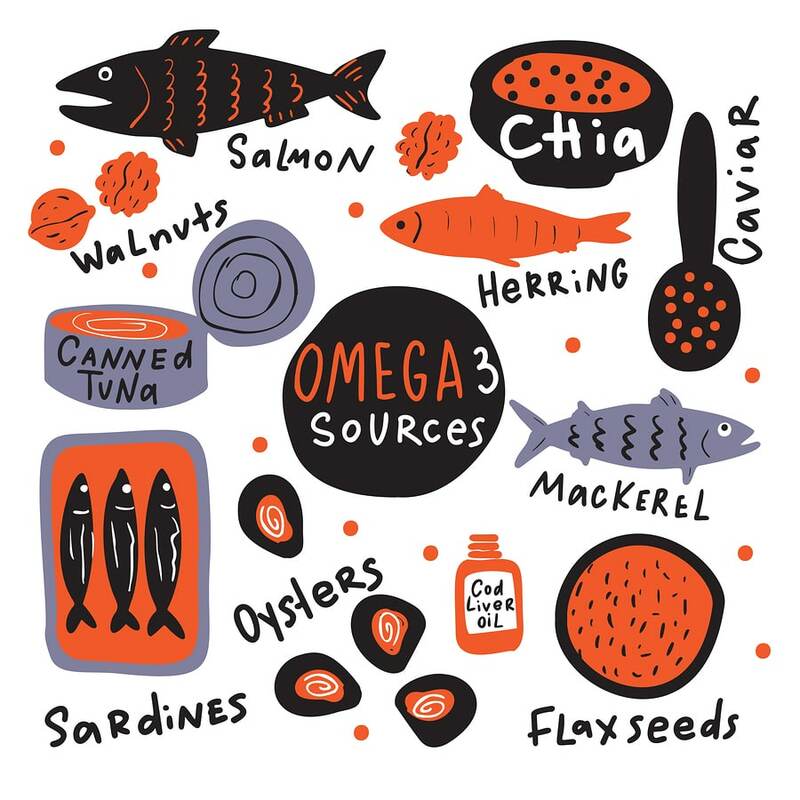 There are three more foods worth mentioning as Omega-3 boosters. Those are winter squash, fish and olive oil. With fish, you will get at least 1.3 grams from about 4 oz of salmon and a little over 1.4 grams from sardines. A cup of winter squash will give you around 0.2 grams. Extra virgin olive oil has about 0.1 grams of Omega-3s per ounce. With fish and olive oil, just make sure to stay away from frying, because frying damages the Omega-3s. Many people are hesitant to eat fish due to the heavy metal toxicity in our oceans and fish farms are disgusting. Fish farms have issues like antibiotics, chemical exposure. The best fish oils are sourced from small coldwater, wild-caught sardines and anchovies. They and are molecularly distilled to remove all heavy metals, rancid fats, bacteria, molds, and yeast. Every batch of Mini Omega 3x is individually tested and certified. A patented delivery system for EPA and DHA fish oils has increased absorption by a heavy-hitting 300%. This delivery system allows for significantly lower doses, smaller capsules, and NO FISH TASTE. 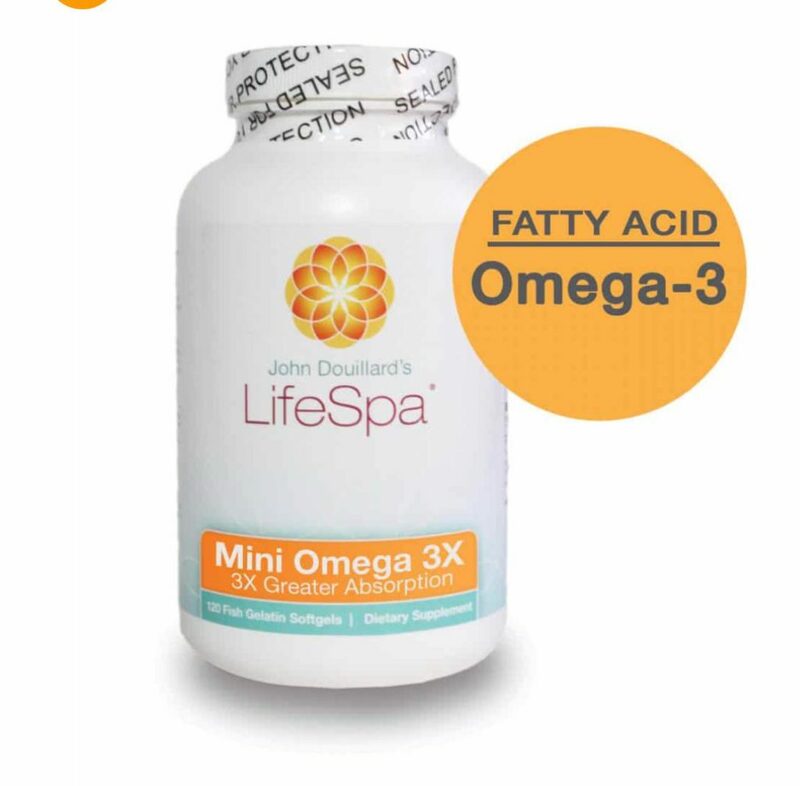 LifeSpa's Mini Omega 3x Fish oil softgels deliver EPA and DHA directly into the bloodstream at three times the absorption rate.